But mastering all the types, knowing about equipment and techniques require some time. Even it’s a daunting task to choose a rod and reel separately. It’s great if you choose rod and reels separately like here’s an article where you will find the best saltwater spinning rods for the money. That ensures the best possible quality. But what if you don’t know much about rods or reels specifically! That’s when the rod and reel combo comes to the scenario. It’s a wise decision to start your fishing with any of the Best fishing rod and reel combo for beginners. After fishing over and over again, you will be mastered over time. Let’s find out some of the Best fishing rod and reel combo for beginners which could make your fishing awesome! Description: Abu Garcia is known for the quality products they produced over the years, they are insanely good at making fishing tackles. This time they present a rod and reel combo called Abu Garcia Black Max baitcasting rod and reel combo which is a tremendous choice for fishing. It’s a baitcasting combo setup, who wants to go for baitcasting setup and looking for quality in a low budget, it’s the combo for them! 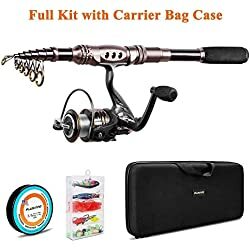 I would not say the best rod and reel but in this crazy low price, definitely, it’s the rod and reel combo you can rely on. Rod: Let’s come to the fishing rod comes with this combo, impressive one I must say! The rod comes with 3 different size and power options. Between them, we recommend the 7’ medium-heavy power rod with fast action. You can also choose the 6’6” medium power moderate action ( 1 piece ) or the 6’6” medium power moderate fast action ( 2 pieces). You can do bank fishing, kayak fishing with any of this size. The rod blank is constructed with 24- ton graphite, it’s sensitivity, durability, and power is awesome. Graphites are well known for their sensitivity and lightweight,a far better option than a just glass fiber rod. There’s not much to say about rods, it’s simply amazing. Reel: though Abu Garcia is extremely good at making fishing reels, the reel comes with this one is not probably that much reliable. We were much happy with the rod, but the reel is a bit of medium quality. Not a low quality nor a premium high quality. But when you are getting an overall high-quality combo under 100 bucks, you gotta sacrifice something. The reel offers a Sleek, lightweight reel design with 1-piece graphite frame and graphite side plates. About smoothness, it got 4 stainless steel ball bearings and 1 roller bearing. Told ya, Not so smooth but works fine. Abu Garcia has this Power Disk system which ensures smooth drag performance through the entire drag range, it’s pretty cool. Overall the reel can provide good support with the rod, for some casual fishing it will work just fine. Overall, it’s one of the best fishing rod and reel combo for the money. The rod is amazing, not much happy with the reel. But you know the deal, right? You always can attach another baitcasting reel for a devastating performance. Description: In early 1897, a brand came to the fishing industry called Shakespeare and from 1976 they started making fishing rod! Imagine how long they are in the business and lemme tell you, folks, they are literally dominating since they started making a fishing rod. But let’s not go with the reputation, we are searching the facts here why the Shakespeare rods are one of the finest and toughest rods of all time! Let’s find out. Rod: there are different options which are a great opportunity to pick the best match for you. 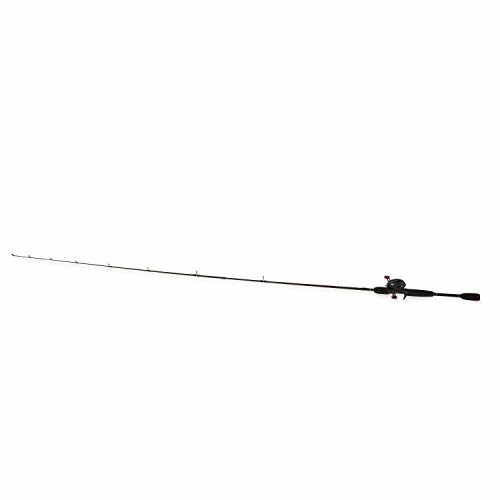 We picked the 6’6” medium-heavy rod for you, it’s the size and power for almost all kind of fishing situation. This Fishing rod and reel combo are ideal for anglers of all skill levels, the blank constructed with Graphite and fiberglass that offers great durability and sensitivity yet so lightweight. What I love about ugly stik gx2 spinning rod is it’s Clear Tip design delivers that adds responsiveness and strength. It can be used as a saltwater fishing rod, the guides are made out of stainless steel. As an upgradation, this ugly stik gx2 spinning combo offers Lightweight EVA grips. What’s best about this handle is it has great foregrip space, this little feature provides comfort during lengthy fishing. No chances of arm fatigue! 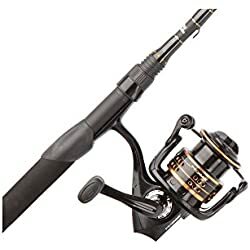 Reel: this Ugly Stik Gx2 spinning combo offers a reel which has 3 ball bearings, the low bearing number can confuse you but trust me it works fine! Not super smooth but works fine! It also has this one-way clutch instant anti-reverse bearing which ensures smooth operation. You will find a 5:2:1 gear ratio with this rod, it’s a low-end gear ratio perfect for the novice fisherman. You can use 210 yds. -10 lb. mono with the reel, lighter lures and lines works great with this ugly stik gx2 spinning combo. Ugly Stik gives you the best value for money! 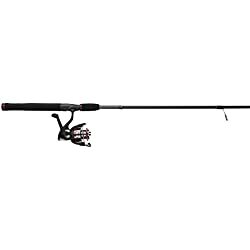 Very few rod and reel combo is as reliable as this Ugly Stik GX2 spinning combo. The best thing about Ugly Stik is, they always provides the Best fishing rod and reel combo for beginners in insanely low price! It’s always a win win with Ugly Stik. Description: I barely could pronounce the brand name, but trust me it’s an awesome baitcasting rod and reel combo. The most satisfying fact about Sougayilang is they are so good at producing quality rod and reel combo with so many options at such a cheap price. Sounds good, isn’t it? To bring more variation to our best saltwater spinning rods list, we decided to add this Sougayilang Spinning Fishing Rod and Reel Combo. Personally, I’m not a big fan of the rod and reel combo cause always you pick a combo you have sacrifice something. It’s best to buy all of your fishing components separately if you want the best quality and reliability so you can get the most out of it. But then again I understand some folks might don’t wanna take the hassle to do that or randomly need a fishing rod and reel combo. So we thought why not! 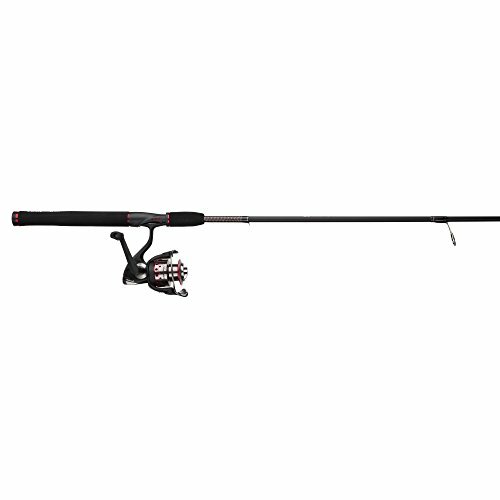 Description: Here’s our second choice from Abu Garcia, it’s an Abu Garcia Spinning combo which is mainly the Pro Max series. A bit upgraded from the Black Max series which causes some extra bucks, definitely worth it! If you ask me about give some options for the best fishing rod and reel for beginners, Abu Garcia Pro Max spinning combo surely deserves a chance. Rod: there are only two options available, you can go for a 6’5” or a 7’ rod. I prefer the 7’ rod for most of the fishing scenario. It’s a medium power rod with fast action. The blank is constructed with I-M6 Graphite. This Mid-modulus graphite blank construction is the reason for great sensitivity and lightweight. The rod is ok, you can do general fishing with this rod, not the best nor the worst! Reel: the reel you get with this Abu Garcia Combo spinning setup is pretty amazing, sturdy enough and works great. The fact you’re gonna love is this reel got 7 ball bearings ( 6 ball bearings + 1 roller bearing ). Now that offers a smooth and pretty fast retrieve. The reel has a Lightweight Graphite Body And Rotor, it enhances the performances a bit. They used Machined Aluminum Spool which Provides Strength Without Adding Excess Weight, that’s the catch of aluminum. The bail of the reel is extraordinary. It’s the Everlast™ Bail System For Improved Durability, gives a loud click which is so helpful. You can use all type of line with this reel, monofilament line works best though. Spinning reels are great for beginners out there, precisely this Abu Garcia spinning combo is ready to take the game. Give it a try! Overall, it’s a perfect combo for the beginners. I use this setup mainly for bass fishing, the reel is what I love from this combo. Rod doesn’t satisfy me much, you can check out this cool list where you will find some of the Best Saltwater spinning rods for the money. Unless that, it works great. Especially in this price range, it’s totally worth it. 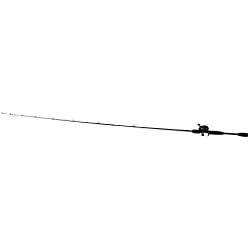 Rod: it’s a spinning rod ranges from 5’91” to 10’83” with medium power and fast action. There are tons of option available with this rod, carefully choose which one you prefer. They claim that it could be the best birthday present or valentine day gift for your loved ones who are willing to start fishing. Reel: Plussino reels are famous for good longevity. It’s a pretty ergonomic reel, feels sturdy. 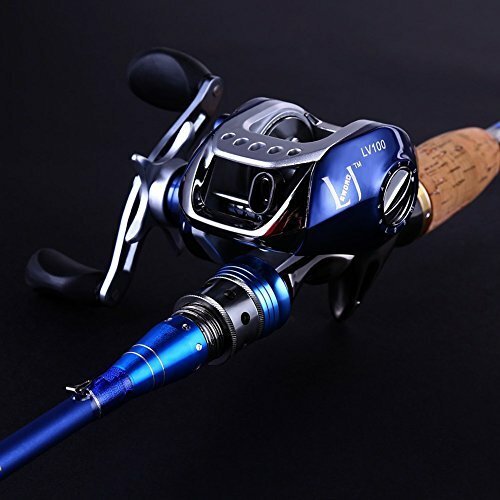 The reel has features like Instant anti-reverse, Power drive gears equipped for high strength and aluminum spool with double color and one line hole. Overall, it’s a brand you can trust. If you need a telescopic rod, this could be a better choice than any other telescopic rods out there. 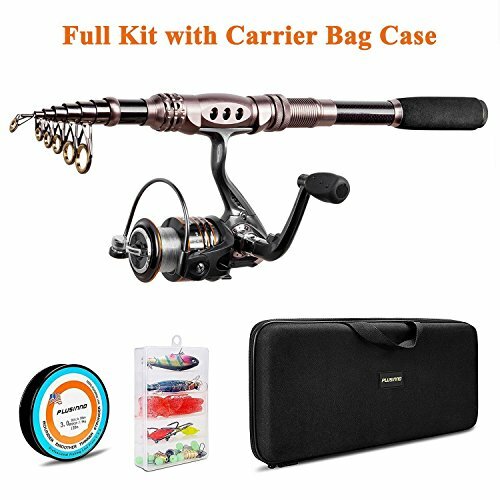 Description: If you are planning for a trip to somewhere heavenly and planning for some casual fishing there, our next rod and reel combo is for you in our today’s best fishing rod and reel combo reviews. Sougayilang is a Chinese brand which made their recognition by producing some good fishing tackles. This Sougayilang telescopic fishing rod and reel combo is a great travel rod, you can even carry them in your carry-on bag! 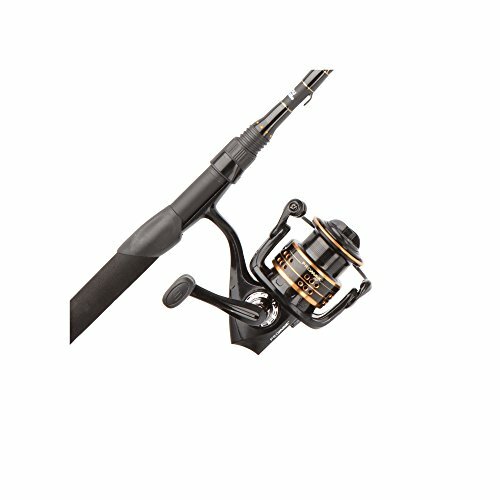 Rod: like typical Sougayilang fishing rod reel combos, this combo also offers various deals. In the options menu, you will find FULL KITS that INCLUDE: The kit comes complete with rod, reel, line, lures, and accessories; FISHING ROD+REEL: ONLY include 1 fishing rod and 1 fishing reel. I personally recommend you to pick the Fishing rod+reel. The more kits you pick, greatly the quality degrades. The material used in this rod is high-density Carbon fiber mixed with fiberglass which makes your fishing pole hard & durable. The power is medium. It offers a good amount of Lightness, rigidity and High sensitivity. The guides are made out of Stainless Steel, Hooded Reel Seats is anti-seawater fully corrosion resistant. Also has EVA Fore Grip for extra comfort and grip. Pretty satisfying, isn’t it? Reel: it’s a pretty impressive reel they offer with this combo pack. Has 13 + 1 Corrosion Resistant Smooth Ball, the gear ratio you get from it 5.5:1. You will find features like Instant anti-reverse, Power drive gear which equipped for high strength. In total, it works fine. Overall, this sougayilang fishing rod reel combos are not something that strongly you can trust with! It’s just a great travel rod or you can present it as a birthday gift or valentine gift. We may not expect some heavy fishing from this telescopic sougayilang fishing rod reel combos, but obviously for some casual fishing, it gives a great value. Description: Mitchell is a famous brand providing fishing tackles about 3 generations now. If you don’t hear the name, maybe you just started fishing. But if you are an old school, I’m sure you heard the name “Mitchell”. The Mitchell 300 reel history is quite interesting but let’s keep it straight and not go to history. Let’s explore more about this elegantly designed Mitchell 300 combo Pro series. Rod: though there are huge options, for most of the fishing scenario we suggest the 2 pieces 7’ medium power rod with fast action. It’s kind of the moderate configuration for every fishing scenario, besides you can carry the rod easily. You will find different size varies from 5’6”-7’ with various power and action. For drop shots, topwater etc. you should go for a 6’6” medium power rod. And for soft plastic baits, medium-heavy 7’ rod is the best option. It’s made with 24-ton graphite. Let’s give you some info that could be helpful in understanding rod blank material. Tonnage is a numeric value for rating graphite. The higher the graphite tonnage the stiffer the graphite is and the more vibrations are transmitted through the rod. As tonnage increases, less material is required to achieve the same action reducing the weight of the rod and increasing sensitivity. Another upgradation that makes the Mitchell 300 Combo Pro different from Mitchell 300 Combo and Mitchell advanta rod and reel combo is the split EVA grip handle. With a Mitchell 300 combo, all you find is the same 24-ton graphite blank with stainless steel guide inserts like Mitchell 300 combo has. Only the difference is the Mitchell 300 Combo got cork handle. Reel: all I can say about the rod is kind of OK, not too good nor bad! But about the reel, it’s amazingly good folks! It has so much to praise about. Let’s start with the 10 Bearings With An Instant Anti-Reverse. Yes, folks, you saw right, it offers 10 bearings. Imagine how smooth the performance is! It also offers Innovative Bail Halo For Superior Strength, you can fill the click when you use the bail of the spinning reel. There is so much to say about this awesome reel. The reel has an Aluminum Spool And Handle With A Eva Knob, Extremely strong and advanced Polymeric Body And Rotor. That makes the reel different and premium from all other rods in the market. Another amazing feature of this reel is it got Smooth Hybrid Carbon Fiber Drag, you can actually feel how effective, responsive and powerful the drag is with the reel. Overall, to me, Mitchell 300 Pro combo is one of the best fishing rod and reel combo for the money. Don’t give a second thought with this one. Check it out from below! Description: In today’s best fishing rod and reel combo reviews, our next recommendation for you would be Pflueger Trion. Pflueger is the brand you can put your trust on! I personally got many of them, specifically those reels from Pflueger are the real deal! Let’s dive into this combo, why we choose this to our tackle list! Rod: it’s an I-M6 Graphite rod, the Mid-modulus graphite blank construction provides a great sensitivity. Graphite rods are not that heavy like glass fiber, it’s lightweight which reduces arm fatigue largely. If you are looking for the best fishing rod and reel combo for saltwater, this could be it! Why I’m saying this cause it got Stainless Steel Guides which are Strong and corrosion resistant guide system. It can handle any harsh environment like saltwater. They already proved them cause many of my angler folks are doing saltwater fishing with this combo for many days. The handle could be a little disappointing, offers a cork handle. Not that comfortable but it’s ok when you are getting a saltwater rod and reel combo in such a low price. Reel: it’s a spinning reel that offers 7 ball bearing, all are corrosion resistant stainless steel ball bearing. Told you, it’s ready to fight in extreme harsh environment. With just a little maintenance can take it a long way undoubtedly. They tried to reduce the reel weight as much as possible so they applied aluminum spool here. The reel gives a smooth retrieve and drags pressure. For all kinds of fishing, this Pflueger Trion spinning rod and reel combo will accompany you. Overall, it’s an awesome rod and reel combo for both saltwater and freshwater. In freshwater, this Pflueger trion combo is mainly used for bass fishing. When used in saltwater, you can use this as a bay fishing tackle ( bluefish, flounder, weakfish ). What the best thing about this Pflueger Trion rod is it’s ready to take any challenge. And the best thing about this Pflueger trion reel is it has 7 ball bearings, so smooth and awesome drag system. Give it a try! Sports Fishing is such an activity where you can connect yourself with nature more intimately. For me and most of the anglers, fishing is not about just getting results or catches. It’s something more than that, it’s spending quality time with our family and loved ones, it’s a great way to release ourselves from stress, exploring the beauty of nature, it’s our passion! Let’s discuss some basics if you just started your journey with a rod and reel! Uhm, I’m talking about your fishing blank so don’t get any ideas folks. Not every rod is suitable for you. You might need a heavier and bigger size rod. Or maybe lighter kind is more compatible. Regardless of how the rod feels in your hand, a few aspects of the rod you should learn about if you don’t know yet. Let’s go from top to bottom. There are plenty of rods out there in the market. A perfect blank that is also compatible with your every cast is very crucial. You can find 4 types of rod available. Fiberglass: Extremely durable. Can withstand user abuse. Offers just enough flex. Not recommend for a beginner due to its higher weight. Carbon fiber: It’s a kind of a graphite rod, but more refined and the reinforced version of graphite. There’s not much to say here. You wanna go, either with a spinning reel or a spincast reel. Baitcasting reel is a great option but I’m worried not for beginners! Though it takes some practice, if you start with a baitcaster you will be mastered in every kind reel. So if you dare to take the challenge, why not! Regardless of what others feel about spinning reel, comparable to Baitcasting reel, I would say that I love the versatility and feel with each turn of the handle. Pro anglers prefer spinning reel over Baitcasting when targeting bass and tarpon. Just flip up the metal bail wire that releases the line when you’re ready for a cast. To lock the line in place, simply flip the metal wire down. Don’t go all trigger happy on the bail if you don’t want to lose your lure. The mechanism of the spinning reel is simple and really easy to master. And don’t forget the affordable price tag! Don’t believe me? Then check out these 9 best bass spinning reel under 100$. Unlike the old days, bigger spinning reel model offers much heavier line compatibility. Competitive angling demands slower gear ratio heavy spinning reel to land some of the biggest game fish out there! The most choices reel by beginners. And for good reasons too. The automated mechanism is so easy to handle, even a child can do it! Some would argue that drag is an issue. Yeah, back in the days, it used to be. But not anymore. The modern state of the art construction methods and premium materials gave a whole new meaning to Spincast Reel. Now, so many manufacturers are featuring an adjustable drag system on the go. A feature that even outshines Baitcasting Reel. The spin cast reel isn’t that cheap build low price tag bearing reel anymore. Of course, you can get some good quality reel under 50$ but, a little more money can get you some of the best spincast reels with super smooth gearing and premium quality. Hey if you’re thinking about doing some angling near a coastal area, perhaps the best Spincast reel for saltwater might help you pick your desired reel. There are different types of bait available. What you choose depends on where and what you’re fishing for. If you can’t get a hold on some live bait than lure is the best option for you. If you’re enthusiastic about using live baits than earthworm is the best option. Because it won’t produce fishy stench and stink up your refrigerator. You can also use grasshoppers, frogs, and crickets. Why use a lure? To avoid losing your bait to smart fishes. I’m sensing you’re gonna try some bass. If that’s the case then pick a bait that stimulates multiple senses. Bottom bouncing: This is a method applicable if you’re angling in current or trolling from a boat. You can cast a jig or live bait up the current and then let it bounce from the bottom. This will make noises and bring up mud underneath the water to attract predators. To make this work, you gotta retrieve faster than usual. Make it bounce to the point it starts to move downstream and keep repeating the process. A great technique for catching rainbow or brown trout. Chumming: This one’s a classic method that still stands the test of time. This one should be passed by the new angler. But still, knowing is growing, right? For this method, you need to buy a special mix of food from the tackle shop. If money is an issue then get some canned corn, pet food or plain bread to attract the fish. Just throw some chums and cast in other spots. After a while, come back and do it again. Beware not to fill their stomach. The idea is to bring the fish closer to you. Dog walking: Like topwater lure like a popper, walking the dog is nearly similar. Cast the line and let it settle down. Keep the tip of your rod close to the water surface. Keep your handle about 1 ½ foot and angle it down slightly towards the tip. Use our wrist to slowly move the rod from left to right. Keep your movement faster than the lure’s movement. The idea is to loosen your line to move it zig-zag style. Keep the line lose by using the reel and play with the lure. It’s like dancing, gotta find that rhythm bro. Jigging: It’s a very popular method among anglers. You can bag some large species of fish just by changing the rigs to find an onvenient color, pattern and customizing blank movement. This style is much suitable for saltwater angling due to its demand for greater depth. Hey just cast and have a cold soda. Let the rig reach the bottom. Now make the rig hop a bit using only the blank’s tip and send it down again. Never bring hoist the blank too high. Because you will fail to hook if there’s a fish on it. Roll the reel downwards when lowering and reeling it back up when removing the bait from the bottom. If you find this complex than give it a rest. There’s something you need to learn practically rather than reading about it. I could still remember how puzzled I was at the beginning! There are so many options and I found it really a daunting task to go for fishing. But now I understand how simple it is! Fishing is such an activity which can be done by anybody of any age, even the money is not a barrier here. With some basic knowledge, you are ready to set your hook! For me, it’s not about getting caught every time, it’s something beyond that! Spending quality time with my family. So gather all the basic equipment today and you are ready to go for a fun trip. Happy fishing, folks!